My wife is at Carrick Glen Senior Living, and its great. We chose it for the staff, the facility, and how well its run and maintained. The apartment has wonderful amenities, the food is good, and she likes it. They have very friendly, eligible, and caring staff members. Theyve got a lot of activities going on for coffee, lunches, and outings to the pumpkin patch, and to look at the fallen leaves. Theyre always doing something, and its cheaper than the place we were at before. Everything in Carrick Glen was exactly what we we wanted for my parents. Everything was fine. They were all very friendly, very helpful, and everything was great. They had an activities room, dining room, and scheduled excursions for them. We chose Carrick Glen because it has the independent villa, which my father needs. They have weekly activities. It is also attached to an assisted living, which he does not need right now, but when he does need it, he can just move in over there. The staff is excellent and so is the cleanliness. At Carrick Glen – it’s about love and family. Home – where love abounds, life is lived, experience is shared, individuality is respected and dignity is honored. That is what our family is like at Carrick Glen Senior Living in Mt. Juliet. Home away from home…that’s what residents will find at Carrick Glen Senior Living! In the heart of Mt. Juliet,TN, situated in a bucolic setting, our Independent Villas and Assisted Living community (Memory Care coming soon!) provides a first class worry-free lifestyle for our residents, along with a caring, supportive staff. Residents will be free to choose to participate in the many planned activities or just relax the day away with family and friends. Carrick Glen is a senior living community in Mt. Juliet, TN offering Independent & Assisted Living. Each and every day, our family takes pride in what we do and how we affect the lives of our residents and your loved ones. Our hope is that you experience the finest of care and community as you start a new chapter of life at Carrick Glen. It is through LOVE, devotion, and true compassion that sets us apart, and it is our intention to ensure every resident feels at home at Carrick Glen. Thank you for your interest at Carrick Glen Senior Living Community. Please give us a call to schedule a free tour. 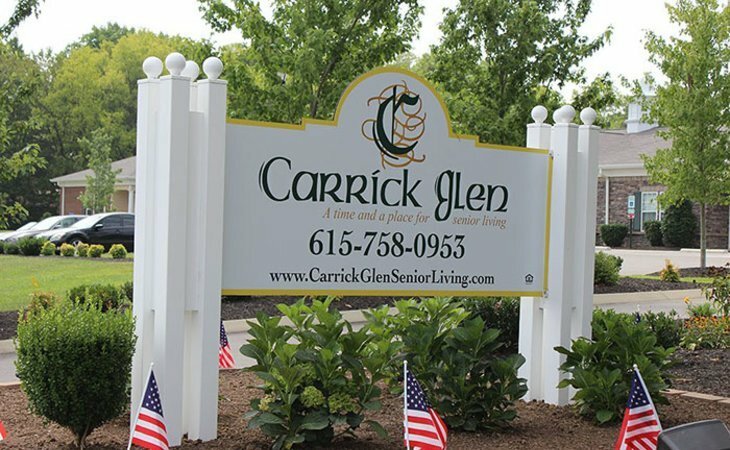 What should caregivers and potential residents know about Carrick Glen Senior Living?